Learn how to grow all the organic food you’ll need in just 20% of the space needed for a traditional garden. This 90 minute class is perfect for beginners and experts alike as it requires no digging, weeding, thinning, or hard work. You’ll learn all the basics of the SFG system and will be able to have your garden up and ready to go in an hour. 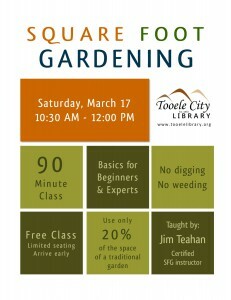 This course is taught by Jim Teahan - a certified square foot gardening instructor. Arrive early. Seating is limited for this free training event.